Little Bit Funky: c'mon get happy. does this wall make you as happy as it does me? while the art has taken some time and money to collect...the bunting was FREE! i'll tell you how in a moment. clockwise starting with the stiched art which is from little bit funky. where i am weak print from mod memento. God love you print from daisychic. let's have fun today from bangbangyourethread. ignore the rain print from daisychic. initials in the hands print from lepapierstudio. want to make your own banner? it's so easy that i didn't do a tutorial really. punch out a bunch of shapes of your choice. would be cute with circles or hearts or any shape really. in a baby room? nice. and because it's free...when you get sick of it...it won't hurt to get rid of it. go read this post by the bloggess. my favorite line is "this chicken will cut you!". what's yours? Super cute! That wall would make me super duper happy! $200 of chicken for FREE!!!! Secondly, I laughed out loud the whole time I read that blog post AND forwarded it to both my sisters who I know will also appreciate it. My favorite line is "15 YEARS IS BIG METAL CHICKENS." Hih--larious. I love love love this! Very happy! I may have to copy this a bit....hope you dont mind! Are there anymore headband covers left? Or even the headbands themselves? I'm hooked! 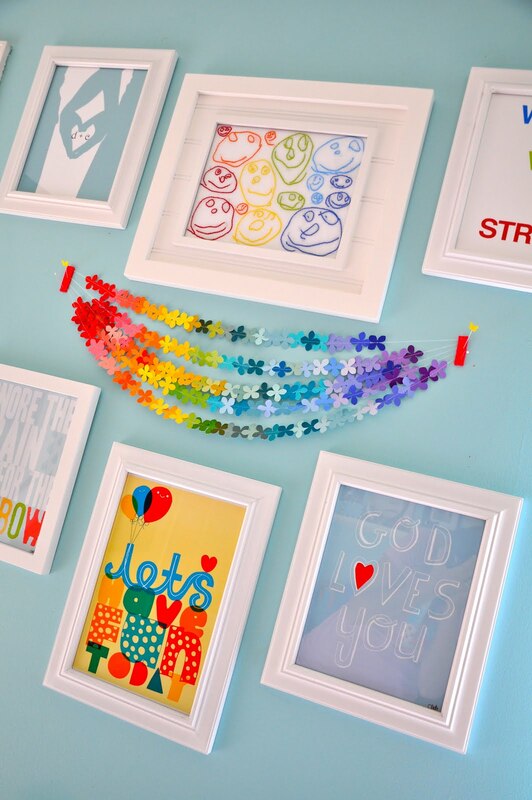 Your wall is so full of happy. Love it. And yes, I'm not one for strong language but that link was soooo funny. Dad's a chicken farmer which just adds to the silliness. I think I will be giggling all day. Thanks! I'm still crying! I had to send this story to my favorite people, thanks for sharing! I burst out laughin so hard at the picture and it's title... oops! Favorite line "CHICKEN DOWN! CLEAN-UP IN AISLE 3!"... I could not stop laughing...I was crying I was laughing so hard! Thanks for sharing i need a good laugh! thanks so much for sharing that link! my husband thought i was crazy for laughing and crying so hard, until i read it to him!! i absolutely love that wall. it's just wonderful. oh my word that was hilarious!!!!!!!!!!!!!!!!!!!!!!!!!! "chicken down! clean-up on aisle 3" definitely ties w/ "this chicken will cut you!" i was so totally crying reading that. i love how she posts like she's talking to you face-to-face. thanks for sharing that and all your happy stuff!!! Oh how I love all the brilliant colors! I may have to hit up Lowe's this weekend! Thank you for the inspiration! This is the happiest. wall. ever. Love the choice of prints. LOVE the sewn garland. Love it! I'm loving all of the paint chip crafts! So cute! That is the coolest thing ever! I would love it if you would link up to my Tuesday Confessional link party going on now: http://www.craftyconfessions.com/2011/06/tuesday-confessional-link-party.html. I hope to see you soon! I would love for you to stop by my blog and add your link to my Inspire Me Monday linky. this is so awesome~~ i love it! Love this idea - and the post from the Bloggess. He-he. 15 YEARS IS BIG METAL CHICKENS! "This chicken will cut you!" was my FAVORITE. I may or may not say it once a day now. That bunting is spectacular - thank you dearly for sharing. Just to look at your pictures brought a smile to my face! 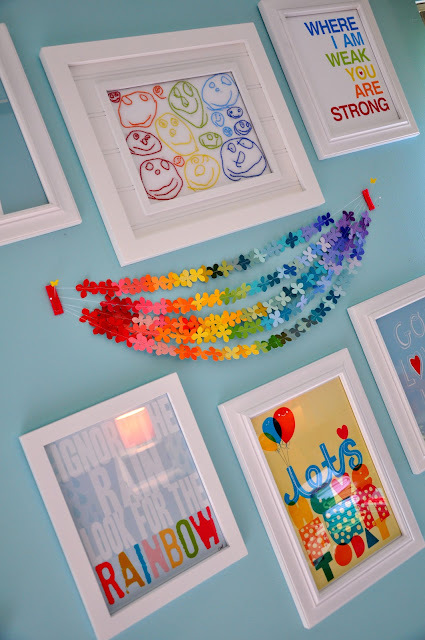 The paint chip garland you created is simply stunning! I'm working on a post for TLC's Parentables. I will be compiling ideas of things you can make with paint chips. May I have your permission to use one of your photos and link to this post? Hi, I love this idea and would love to feature it in an article I'm writing about teen bedroom DIY craft. Please email me to let me know if you give me permission to use the idea and a photo or two. My email address is katethompson777@gmail.com. We will give you full credit of course. Thanks, Kate.